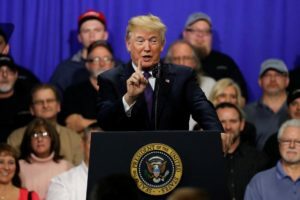 At a rally in Ohio shortly after the State of the Union, Trump complained about the behavior of the Democrats present at the speech. He referred to their activities – including checking their phones during the speech, refusing to clap, not standing when he entered the room, and so on – as ‘un-American’ and ‘treasonous’. Immediately, these comments came under extreme scrutiny. Representative Nancy Pelosi (D-CA) tweeted that she, and other Americans, were alarmed by these remarks. Search attempts for the definition of ‘treasonous’ increased 5900% in the wake of the story according to Merriam-Webster. In recent days, Democrats have returned fire at Trump. Joe Biden called Trump ‘a joke’ in response and many other Democrats have called them troublesome, stating that they show an authoritarian pattern in Trump’s rhetoric. Some Republicans, such as Senator Jeff Flake (R-AZ), also criticized these remarks, tweeting “Mr. President, treason is not a punchline.” However, Trump has faced little backlash from the Republican party establishment or his own base. Republicans which have criticized these comments tend to be ones which have already tilted against him, such as Jeff Flake. Historically, unpopular remarks by Trump would often get attacked by persons like Speaker of the House Paul Ryan, such as the backlash he faced following his proposal on Muslim immigration. The absence of this seems to indicate that Trump has gained more legitimacy as the head of his party and gradually becoming immune to criticism. Of course, it is also true that many top Republicans maintain that these comments were a joke, and not to be taken too seriously. After all, Trump frequently uses bombastic rhetoric at campaign rallies, such as when he used expletives to describe his strategy against ISIS. Additionally, several have pointed out times when top Democrats referred to Republicans as treasonous. For instance, Cory Booker (D-NJ) said that the release of the Nunes memo “could be viewed as treasonous.” While not as direct as Trump’s comments, they appear to have the same message. However, Democrats have responded by saying that these comments merely leave open the possibility and are a far-cry from a sitting president referring to his opposition directly as treasonous. Additionally, the gravity of declassifying a controversial memo compared to refusing to applaud is immense. Even more so when one considers that the opposition party sitting stone-faced and unenthused throughout the State of the Union is time-honored, if childish, tradition in American politics. Compared to other outbursts at the State of the Union, such as when Representative Joe Wilson yelled “You lie!” at President Obama, the behavior of the Democrats was far from terrible. A few have theorized that these comments were a ploy to deflect from other news. It is true that these comments were made following the stock market downturn, and Trump may have simply wanted to distract from the bad press with some off-hand remarks. All the same, these remarks have startled some. Whether they are serious bellwether of future policy or simply one of many Trump gaffes remains to be seen. First-year Joshua Cropanzano is a contributing writer. His email is jcropanz@fandm.edu.